storied career. The Winston, the All Star game of NASCAR, was originally conceived of by T. Wayne Robertson and Humpy Wheeler in 1985, the same year RJ Reynolds started the Winston Million. In it's earliest, and purest, form, only drivers who had won a Winston Cup race the previous season were eligible to participate, there was no inverting the field, and no time outs. The Winston is now open to drivers who won a race last year, previous Winston Cup champions, previous Winston champions, and if that still doesn't fill the field, race winners from previous years. I think maybe drivers also get to pick a number between one and ten that Humpy is thinking of or enter a swimsuit competition to get in this year. All the other drivers get to attempt to make the field in a pre-Winston qualifying race. Even with all the changes the concept of the race is fairly simple; pit the best drivers in the sport against one another, in a short dash style format, with no points to worry about and a lot of money on the line. That guarantees the drivers will go at a win hell bent for leather, or as Ken Squier might say, "Checkers or wreckers." In essence the Winston is stock car racing for those inclined towards Attention Deficit Syndrome. The 1985 Winston featured 12 drivers, all of whom had won races in 1984. Darrell Waltrip started on the outside pole and charged into the lead as soon as the green flag dropped. Wheeler was dangling a 10,000 dollar carrot to the leader on lap 20, and Terry Labonte, defending series champion, stormed into the lead to claim the prize. He and DW engaged in a spirited battle for the lead. But when the dust settled after the required pit stop at the midpoint of the race, it was Harry Gant who came out on top, thanks to quick work by his Mach 1 crew. In fact Harry seemed to be cruising towards a comfortable win, with a lead of over three seconds. Then it happened. Darrell Waltrip found a sudden burst of speed, chased down Harry in the matter of a couple laps, and roared by him. There are two common explanations for what lit the afterburners on DW's Junior Johnson owned Chevy. DW told reporters Junior got on the radio with him, and in a furious mountain drawl asked, "You ain't laying down on me out there, are you boy?" Others say the engine under the hood of Waltrips car was way oversize, and he had been stroking to avoid raising suspicion. We'll never know. Coincidentally the engine in the Johnson/Waltrip entry exploded just as Darrell crossed the finish line under the checkers. You can't close the door when the walls caved in, and you can't measure an engine that's scattered the length of the front straight in bite size nuggets. But Junior had been known to bend the rules just a bit. In fact after the 1991 Winston, Junior's Budweiser Ford ( with Tommy Ellis substitute driving for an injured Geoff Bodine) was found to have an oversize engine, and Johnson was slapped with a 4 race suspension. I guess Ellis couldn't find the grenade button. Waltrip won 200,000 dollars for his victory. While by today's standards that may not sound like a lot of money, keep in mind Bill Elliott won only 185,000 dollars for dominating that year's Daytona 500. As originally conceived the Winston would move from track to track, with a different facility hosting it each year. As it turned out the 1986 Winston, held at Atlanta, was the only Winston not run at the Humpyville Speedway, better known as Charlotte. That race was a disaster for two reasons. Bill Elliott flat out made a mockery of the event, and won going away. Secondly, the race was held on Mother's Day, not a great idea on the part of the promoter, and only 18,500 fans showed up. After that debacle the well tuned gears in Wheeler's head began churning, trying to think of some ways to ensure the race was always exciting. Rule number one if you want an exciting race is to be sure to invite Dale Earnhardt. Perhaps the most famous, or perhaps infamous Winston was the 1987 event. The format that year had been changed to try to stir things up a little. Rather than a single race, the Winston consisted of three segments, the first 75 laps long, the second 50, and the final a ten lap dash for the cash. Among the 20 drivers in that years event, was Tim Richmond. Richmond had missed the beginning of the 1987 season, due a mysterious flu-like ailment, and was using the Winston to see if he was ready to return to combat before trying a full points race. Bill Elliott thumbed his nose at Humpy's rule changes, by going out and flat dominating the first two segments of the race. The cars lined up for the ten lap Shootout with Elliott on the pole and Geoff Bodine on the outside pole. Richmond was lined up behind Elliott, and Earnhardt was right on Bodine's rear bumper as the green flag dropped. Bodine knew his only chance at a win came at getting a jump on Elliott and beating him to the first corner. Geoff managed to nose ahead of Bill, and Earnhardt decided he was going to force his way past both of them. Bodine dove low and ran Bill onto the apron. Elliott's car got loose and made contact with Bodine's rear bumper, sending him spinning. Earnhardt made a nifty move right through the middle of the mess and grabbed the lead. The caution flag for Bodine's spin bunched up the pack to try it again, and Elliott and Earnhardt engaged in one of the most furious battles our sport has ever seen. Elliott had the faster car, but Earnhardt was making his Chevy awfully wide to keep Bill from getting by. The two cars made contact numerous times, though whose fault that was depends on which driver's shirt you wore to the track that day. With seven laps to go Elliott was on the outside of Dale trying to bull his way past. Heavy contact was made, and Earnhardt was sent flying down the track and across the grass. 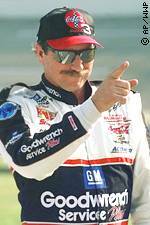 Dale never even lifted off the throttle and charged back onto the track without even surrendering the lead. But Dale wasn't too happy about the infamous "Pass on the grass". On the back straight Dale got out of the throttle. Sensing his rival might be losing a tire, Elliott went high to make the pass. As Elliott drew along side Earnhardt cut the wheel hard right and sent Bill into the wall. A lap later Bill lost a tire and he lost a lap in the pits. But the fireworks weren't over. The normally laid back Georgian driver was so angry, Elliott charged back onto the track and rammed into Earnhardt's car. Geoff Bodine thought that was a fine idea, and rammed the Wrangler entry as well. All three drivers wound up getting fined for their actions. While nothing can ever compare to the 87 Winston, Rusty Wallace gave it his darndest trying in 1989. He and Darrell Waltrip had the two dominant cars that day, and as the ten lap shootout began they were once again in a league by themselves. Darrell grabbed the point and had the lead. Rusty had his eyes on the prize. Heading for the white flag out of four, Rusty went low, put a bumper into the rear of the car, and sent DW spinning. Under the rules that year, yellow flag laps did not count towards the 10 lap shootout. The field was lined back up with two laps still to run, since the yellow had waved before Rusty took the white flag. Darrell was insistent that since that lap hadn't counted he should start in the lead. NASCAR was equally insistent that DW start at the rear of the field. NASCAR won. Rusty cruised on to an easy victory. Well it wasn't all together easy. Some fans in the stands were so outraged by Rusty's move, not only were they booing and hollering, they were throwing full cans of beer at Wallace's car, trying to affect the outcome of the race by decapitating him. When Rusty won the booing got even louder, so loud in fact Jeff Gordon has never heard anything like it. The aerial barrage of beer cans and other objects continued raining out of the stands. Nor was Darrell very pleased. "I hope he chokes on that 200,000 dollars." DW told reporters. "I haven't talked to him (Wallace) yet, and I'd be better off if I never did again. It's no use getting into an argument with a fool." It was a changing of the guard of a dubious sort. For years Darrell had been the driver the fans loved to hate. That day Rusty Wallace became the Jeff Gordon of the era. In fact DW went on to win that year's most popular driver award. Yes, someone other than Bill Elliott has won that award. No, Rusty Wallace didn't fare too well in that years voting. Another infamous finish to the Winston occurred in 1992. Once again the format had been scrambled after Davey Allison had stunk up the show by dominating the 91 event, flag to flag. There were a few key changes in 1992. That year, the race was broken up into two 30 lap segments, followed by a ten lap segment for all the marbles and money. After the initial thirty lap segment, the order the field was running was inverted for the second segment. Also of note, that years race was run at night, under the brilliant glow of Charlotte's hot new lighting system. Allison won the first segment, and as a reward got to start dead last for the second. Kyle Petty beat out Geoff Bodine to earn the pole position to start the 10 lap event. Kyle seemed to be going for the win, but Darrell Waltrip spun out (with no assistance from Rusty, let me add quickly) and the caution flag flew. As the pack raced to the yellow flag, Earnhardt made a gutsy move to bull by Kyle for the lead. Humpy had to be in Heaven. A one lap dash would decide the winner. Kyle knew he'd been outwitted, and was committed to getting back around Dale. He dove low to the inside of the 3 car, trying to pass on the bottom of the track going into turn three. Earnhardt ducked low to block him. Kyle moved lower. Dale moved lower as well. Davey Allison lurked in third place waiting for his moment, like a snake in the high grass outside a puppy mill. Both Earnhardt and Petty came out of four at an impossible angle. Dale's car went spinning and hit the fence. Kyle was completely sideways trying desperately to regain control. Davey drove right between them and took the checkered flag. But Petty had tried to keep his foot in the gas to grab one more shot at the win. He went flying across the grass at the dogleg and rocketed back up the track out of control. Yards beyond the finish line he hit Allison's Thunderbird, and Davey hooked a hard right head on into the wall. Allison was knocked out and had to be transported by helicopter to the hospital where he was diagnosed with bruised lungs. Even worse, Davey was going for the Winston Million at the 600 the next week, and besides being beat up, he had lost his favorite car, the 007. It was one of the few times that the winner of a race never appeared in victory circle. Sometimes you get the checkers, sometimes you get the wreckers, and that night Davey Allison got both.